As Jeff Foust reports in SpaceNews, Blue Origin Senior Vice President Rob Meyerson made the announcement during his keynote address at the Amazon Web Services Public Sector Summit, held earlier this week in Washington DC. “We plan to start flying our first test passengers soon,” he told the audience, adding that, “We expect to start selling tickets in 2019.” No price was given for a ride aboard the New Shepard reusable launch system, but it likely won’t come cheap. Estimates range from $50,000 (£37,700) to $250,000 (£188,400) per seat. Those who can afford it would be in for a treat. The New Shepard capsule accommodates six astronauts, and it has a reasonably spacious 530-square-foot interior — a space that’s 10 times larger than NASA’s Mercury capsule. 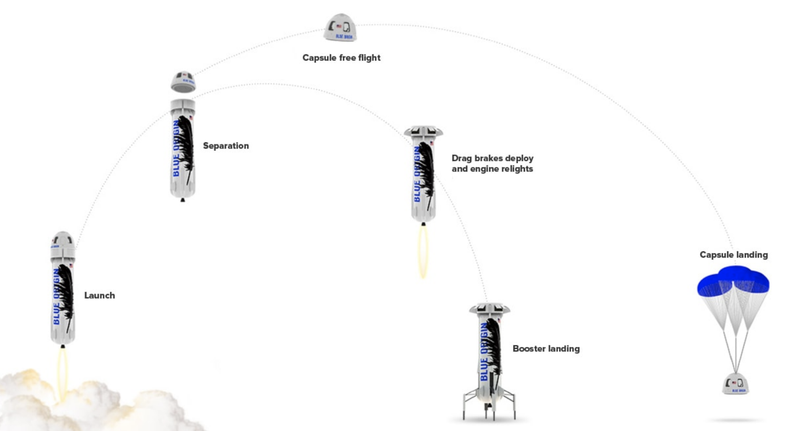 The New Shepard reusable rocket is driven by a single BE-3 engine, which provides 110,000 pounds of thrust. Once the capsule crosses the Kármán line — the boundary that separates Earth’s atmosphere from space (around 328,080 feet, or 60 miles above Earth) — passengers will be able to undo their seat belts and experience weightlessness. The mission ends with a parachute-assisted descent and a soft landing in the Texas desert. Now, it’s completely possible that the Jeff Bezos-founded company will start selling tickets for suborbital flights next year, but that’s no guarantee the flights will happen any time soon. Take Virgin Galactic, for example, which started collecting deposits for tickets more than a decade ago, well before SpaceShipTwo was anywhere near being ready to tickle the edges of space; the Richard Branson-led company managed to gather about $66,428,500 (around £50 million) in deposits, selling tickets at $200,000 (£150,700) a pop. It should also be said that aspiring space tourism companies are notorious for overselling expected delivery dates. Like SpaceX, which postponed its plan to send a pair of space tourists, who had also paid a deposit, around the moon and back later this year. Critically, Blue Origin has yet to perform a test of the New Shepard system with human occupants. To date, the company has conducted eight tests, the most recent happening on April 29. This last test saw a successful takeoff, crew capsule separation, and soft landing with parachutes. But the vehicle’s propulsion module was lost due to a hydraulics problem.